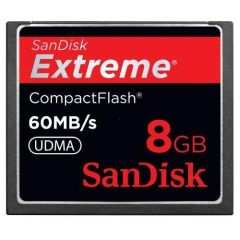 Get exactly the shots you want with professional-grade SanDisk Extreme® CompactFlash® cards. With up to 60 MB/s read/write speeds, you'll see it takes more than a great digital SLR camera to bring your ideas to life. SanDisk engineered its Power CoreTM Controller to take whatever your camera's buffer can dish out. By distributing image data across the card more rapidly and efficiently, this card delivers professional performance.